STREET dreams are made of this. Coronation Street: A Star Is Born is the highlight – for me – of BBC Four’s new autumn and winter 2010 season. It was previously titled Florizel Street and may change its name again before we see it. But whatever it ends up being called, my money is on this drama being a cracker. 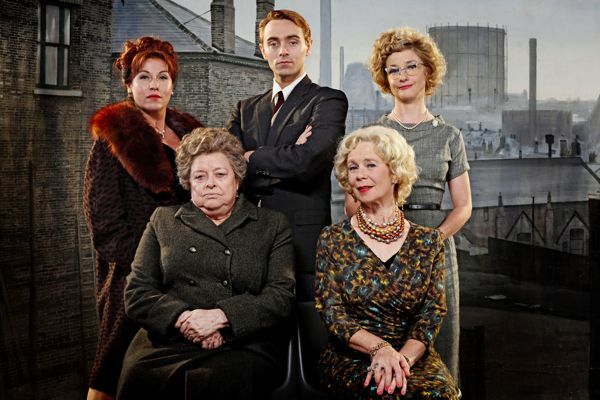 Pictured above (clockwise from top left) are: Jessie Wallace as Pat Phoenix (who played Elsie Tanner), David Dawson as Tony Warren, Jane Horrocks as Margaret Morris, Celia Imrie as Doris Speed (who played Annie Walker) and Lynda Baron as Violet Carson (who played Ena Sharples). The one-off film is written by former Corrie scriptwriter Daran Little, who has since moved on to do the same job for EastEnders. Daran started out as Coronation Street’s archivist and is steeped in all things Weatherfield. As well as being a friend and colleague of Corrie creator Tony Warren. The drama tells the story of how Tony mananged to bring his vision to the screen 50 years ago. Daran has written extensively about the Street, including a book called The Coronation Street Story. “Tony Warren was a genius who created a mould that television writers and producers have followed ever since. “I wrote in my introduction to The Coronation Street Story that the British public owed him a debt of gratitude. That still applies. “Granada Studios Manchester, 6.55pm, 9 December 1960. With minutes to go until the live transmission of episode one, creator Tony Warren (David Dawson) is being sick in the toilets, actress Pat Phoenix is missing…and so is the cat from the opening shot. Coronation Street – A Star is Born [working title] is the epic story of one man’s struggle to make a programme that no one wanted. Granada’s formidable bosses, Sidney Bernstein (Stephen Berkoff) and his brother Cecil (Henry Goodman), are not enthusiastic. But together with producer Harry Elton (Christian McKay) and director Derek Bennett (Shaun Dooley), Tony takes up the battle. He wants cobbles, a pub, seven houses and a shop, but above all he wants northern actors. Led by casting director Margaret Morris (Jane Horrocks) and her young assistant Josie Scott (Sophia Di Martino), the hunt begins for the legendary cast – Doris Speed (Celia Imrie), Pat Phoenix (Jessie Wallace), Violet Carson (Lynda Baron) and William Roache (played by his son James Roache). Coronation Street is born. Posted in Coronation Street and tagged Celia Imrie, Coronation Street, Daran Little, David Dawson, Jane Horrocks, Jessie Wallace, Lynda Baron, Tony Warren. Bookmark the permalink. Was there a cat in the opening shot of Episode 1? I remember two children playing on the pavement outside the corner shop. Maybe they never did find that cat! Thank you so much for this article Ian. I have been looking around, ever since I first heard about this project, for who Shaun Dooley would be playing.